The exhibition was held in the Rare Books Exhibition space, Sir Louis Matheson Library, Monash University from 6 April - 30 June 2000. The Australiana section of the Monash Rare Book Collection facilitates research into the lived experience of our ancestors. 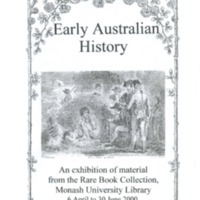 This exhibition included the accounts of early discoverers, settlers and explorers, as well as most of the landmark Australiana volumes: Dampier's account, Captain Cook's three voyages, the First Fleet Journals, as well as such natural history classics as Gould's Birds of Australia, Von Mueller's own specially illustrated set of Flora Australiensis, and a set of his educational specimens of Australian plants.